Gallium nitride (GaN) has attracted much attention due to its outstanding characteristics. It may replace conventional semiconductor materials, such as silicon, that are approaching their physical limitation in terms of power handling, maximum frequency and operation temperature. The native oxide of GaN [gallium oxide (Ga2O3)] has become a potential candidate of gate oxide in GaN-based high power metal-oxide-semiconductor devices. In this paper, properties of Ga2O3 as gate oxide are reviewed. Recent development of various techniques being used to grow or deposit Ga2O3 on GaN are also discussed and compared, with the main focus on thermal oxidation technique and oxide formation mechanism. Fig. 1. 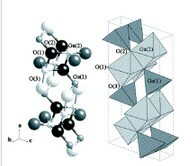 Three-dimensional crystal structure of β-Ga2O3. The Ga atoms with two crystallographically inequivalent gallium positions are denoted as Ga(1) and Ga(2), while the O atoms with three crystallographically different positions are denoted as O(1), O(2) and O(3) respectively .